I just picked up my July kit from Urban Anthology and since I got my pictures back from Costco this afternoon from yesterday's walk, I thought I would create a pretty layout with it right away, let's not waste time here...hehehhe. So, here is the layout I created. 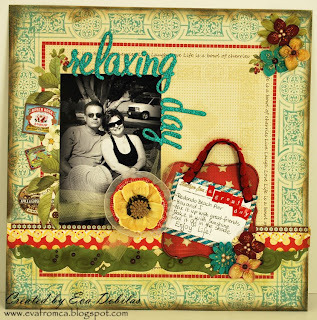 I like it...I used a lot of distress ink on this and stickles as well, and those two go together just perfect, specially with the very yummy Urban Anthology July kit. Well, that is all for now..hope you like it as much as I do.